Way back in late 2009, I was getting antsy, on both a personal and a professional level. I had run my own design studio for almost 20 years. And I’d created just about anything a designer could create, from business cards to billboards — even a glossy, full-color national magazine. But despite my success, I started to feel like there was “more” that I wanted to do with my career. Where will you grow from here? I needed to answer that question. But how? Around that time, I found someone who promised to help me build an online presence in a group coaching program. This sounded like the perfect solution. I could share my hard-won knowledge and reach out well beyond my geographic area. I might even be able to help someone on the other side of the world! I knew right away what I wanted to talk about online. I’d been helping people build their brands for more than 20 years, if you included the time I spent working for someone else. And what I saw, time and again, was that when you combined strategic marketing with great design, amazing things happened. Brands were born. Business boomed. Profits were made. So, I signed up for this program and all its big promises. It was more money than I’d ever spent on my education post-college. I mean, I’m all for Spirit. Of course! But that was not what I was looking for. It didn’t resonate with me at all. I asked for a refund. 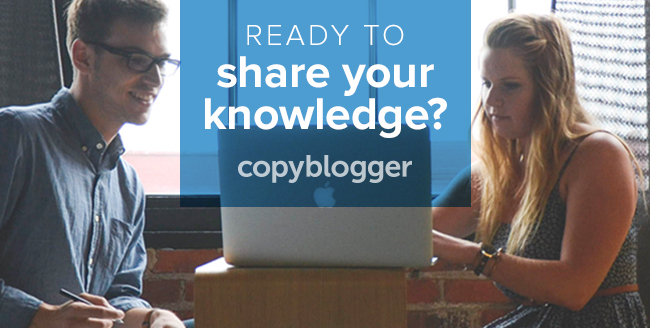 Then, just a few days later, I stumbled across Copyblogger. I don’t remember how I landed here. Copyblogger had been around for a few years at that point, but since my business was squarely in the offline world, I hadn’t come across this incredible website. And (lucky me), Copyblogger was just about to launch Teaching Sells. A few weeks later, I found myself inside a premier online learning experience — having paid less than I paid for the first course — with no chanting to invite Spirit to enter my business (thankfully). At that time, it was a full five months of materials. There were audios to listen to, videos to watch, PDFs to read, and lots of online content to consume. In addition, there was an active forum I participated in. This was a huge help to me: I had no one around me who knew anything about building an online business. The opportunity to share experiences, ask questions (and get answers), and help other students was invaluable. I was able to “process” what I was learning and expand my understanding of the material. And after five months, I knew what I needed to know to start Big Brand System and begin the process of reinventing my career. All because of a well-designed online learning platform. If you’ve lived a few years, I’ll bet you’ve developed expertise in some area of your life. We naturally get good at what we repeatedly do. And eventually, you might notice that people ask you for advice. Of course, it’s flattering when others ask for your help. If you find people often ask you for help on the same topics, that’s a great sign that you have knowledge people would be willing to pay to access. But if you’ve never taught in a structured environment, taking your knowledge and putting it into a consumable form might seem daunting. An effective Learning Management System helps you think about your course structure and organize your knowledge, so you can teach it. This structure gives you “buckets” you can pour your information into. It helps you consider how your students will move through your information. It forces you to pinpoint learning goals and plan out how they’ll reach them. People learn in different ways, and this is a point Teaching Sells emphasizes. Some of us are readers. Some prefer audio. Some people love video. And some need to print online content and put it in a notebook so it’s a tangible object they can touch. It’s a smart idea to package your knowledge so you fulfill as many of these learning styles as possible. And a useful Learning Management System will make it easy to feature these items together on a page so your students can get in there and grab the format they prefer. Back in early 2010, I started putting together my own online course based on everything I’d absorbed from the months I’d spent inside Teaching Sells. And very quickly, I slammed into some of the biggest technological walls I had ever tried to scale. Oh, and write the damn course! The technology piece of the process didn’t feel like a hurdle. It felt like scaling Mount Everest! I mean, I just wanted to share my knowledge. I really did not want to spend my time in my .htaccess files, under the hood of my site, looking at code. The good folks running Teaching Sells knew this. The member forum was full of students trying to slay all the technology dragons that faced them as they built their courses. They took the Teaching Sells course, got excited about the possibilities, and often implemented smaller projects — but when confronted with the technology they had to deal with for a full membership site, realized they would never have the time and energy to tackle it. And — I now know — this really bothered everyone at Copyblogger. So they worked on a solution. And now, it’s here. Rainmaker Platform Pro plan owners now have access to our Learning Management System. It’s a simple, easy-to-use tool that allows you to easily build the module-course-lesson structure you need. Plus, it’s set up to make incorporating multimedia easy. Your students will love it. And you’ll love that all those headaches — setting up the overall course structure, providing a simple way to purchase your course, granting access to your course once someone purchases it — are taken care of inside the Rainmaker Platform. The Learning Management System in the Rainmaker Platform is a dream come true. So start thinking about the knowledge you’ll share now. Because those technological hurdles you thought you’d have to scale? The best news is that the technology for building membership sites and delivering online courses is now simple, thanks to the Rainmaker Platform. Take it on a no-risk 14-day free trial, and start building your digital business the smarter way. Image source: Startup Stock Photos. Previous article: Is ‘Choose Yourself’ Good Advice … or New-Age Phooey?